Loftet (helt uafhængig og fuldt) består af: stor stue med pejs og tekøkken, soveværelse, badeværelse. I stuen findes en sovesofa. Tilgængelige fri internetadgang via trådløs. I nogle specielle situationer har vi rabatter i forhold til prislisten. Før du foretager en reservation kontakt os for at kontrollere, om du kan få en rabat. The Attic (totally independet) is approximately 85 sqm and can accommodate 4 persons comfortably. It is totally independent and is composed from a Large Living Room with Fireplace and Kitchen, 1 Bedroom, 1 Bathroom. The house is equipped with refrigerator, dishwasher, freezer, oven, television set, radio, free wireless internet access. In Some special situations we have discounts compared to the price list. Before making a reservation contact us to check if you can get a discount. Villaen er beliggende i hjertet af Umbrien, et par kilometer fra de største byer i regionen. Det samme bløde bakker med udsigt Assisi, Spello og Perugia, midt i en olivenlund bevaret med omhu og respekt af ejeren. I den store have og »også en swimmingpool (åben fra begyndelsen af ​​maj til slutningen af ​​september, måler 9 mx 5 m med vand højde på 1. 2 m). Bolig særligt velegnet til dem, der elsker isolerer sig i alt privatlivets fred uden at give en enestående udsigt. Faktisk fra huset kan du se nogle smukke gamle byer i Umbrien, fra Bettona, en lille middelalderby (af etruskisk oprindelse), som let kan nås til fods. At bemærke den centrale position i forhold til kunst byer i regionen, alle tilgængelige med bil afstande på mellem 10 og 45 minutter. Villaen består af 4 helt uafhængige dele, 2 til leje (Stor lejlighed og Attic) og to private ejere. Den store lejlighed beskrevet på denne webside, og 'består af: front veranda, entre, stor stue med pejs, spisestue, køkken, 4 store soveværelser, 2 store badeværelser komplet med alt, en lille badeværelse, et stort terrasse med fantastisk udsigt, en mindre terrasse. Fås gratis internetadgang via trådløs. We have a large villa situated on a hilltop in the heart of the Umbrian countryside, 20’ drive from Perugia and 10' from Assisi. Two portions of the Villa are for rent (Large Apartment and Attic), other two portions are reserved for the owners. The Large Apartment sleeps 10 people in 4 bedrooms; The Attic of the Villa is a 1-bdrm attic apartment with a sofa bed and sleeps 4. 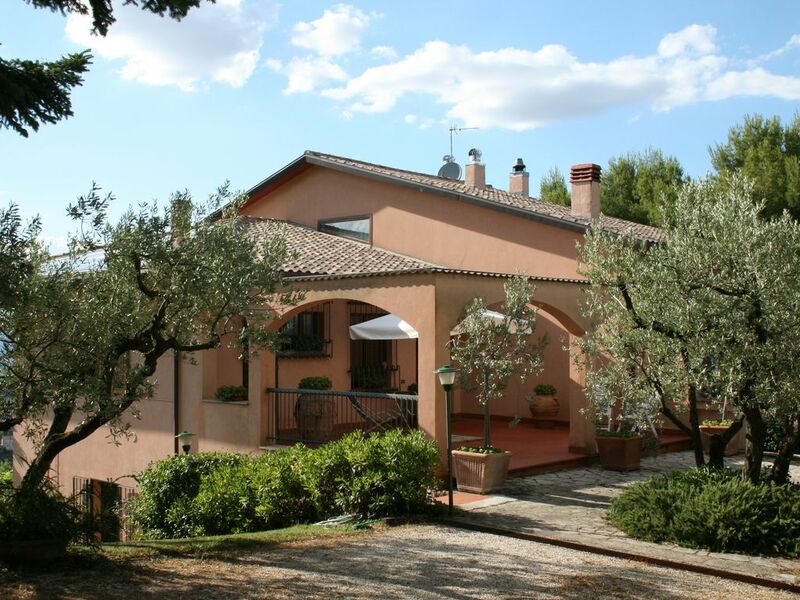 Both apartments have splendid views over the rolling green hills of Umbria. The Villa is only a few miles from the leading towns and cities of the region, famous for their artistic heritage. Situated in an olive grove, lovingly tended by the proprietors, the villa looks out towards Assisi, Spello and Perugia. There is a very nice, large garden with a swimming pool. The Large Apartment is approximately 250 sqm and can accommodate 10 persons comfortably. It is composed from a Large Living Room with Fireplace, a Dining Room, a Kitchen, Four Bedrooms, Three Bathrooms, a Large Entrance Hall, a Large terrace, a Balcony and an Entrance Porch. The house is equipped with refrigerator, dishwasher, freezer, oven, television set, radio, free wireless internet access. There is a washing machine in common for two portions of the Vacation House. The price doesn't include the winter heating (on the base of consume). Possibility of renting for weekends, please contact us to ask for prices. The swimming pool measure 9m x 5m (deep of water = 1.2 m. everywhere); open in the period May - September. The Attic is approximately 85 sqm and can accommodate 4 persons comfortably. It is composed from a Large Living Room with Fireplace and Kitchen, 1 Bedroom, 1 Bathroom. The house is equipped with refrigerator, dishwasher, freezer, oven, television set, radio, free wireless internet access. There is a washing machine in common for two portions of the Vacation House for rent. The price doesn't include the the winter heating (on the base of consume). Before to reserve, please contact us to verify if we may apply a discount. Ottimo soggiorno a Bettona, appartamento attico. Casa si trova nel giardino, posizione buona - Perugia, Assisi e l´altre citta sono molto vicino. Renato e molto simpatico, ha preparato le informazioni per quanto riguarda ristoranti, negozi etc. Ho avuto anche la posibilita assaggiare molto buon olio di oliva di quest´anno. Ritorno certamente prossimo anno d´estate. Gemütliche Mansardenwohnung mit grandioser Aussicht! Wunderschöne Lage, grandioser Ausblick, sehr freundliche vermieter. Ausstattung sehr gut und liebevoll bis ins Detail, lediglich das Badezimmer der Mansardenwohnung ist sehr niedrig und man kann nicht aufrecht stehen, auch nicht beim duschen. Heel,fijn appartement! de ligging is fantastisch met eenheden mooi uitzicht op Bettona, eendrachtig middeleeuws dorpje. Minder geschikt echter voor langere mensen, omdat het plafond boven de trap en in de badkamer vrij laag is. En internet is heel traag als het al werkt. La casa confortevole, il giardino molto bello, il proprietario disponibile, simpatico e accogliente. E' stato un ottimo soggiorno, grazie! locali ampi e confortevoli, giardino grande dal quale si gode di una vista panoramica splendida. I proprietari della villetta sono stati gentilissimi e conto di ritornarvi presto. La consiglio vivamente a quanti aspirano a trascorrere una vacanza in pieno relax. - Efter ca 400 m grusvej drej til venstre ved en ned træer med cypresser ungdom (angivet med et lille træ skilt, der siger 'Casa Morbidelli «). Og 'anbefales at besøge de historiske centre i følgende: Bettona (1 km), Torgiano (7), Assisi (10), Perugia (15), Spello (15), Todi (25), Gubbio (35), Spoleto (40) , Orvieto (40), Bevagna (15), Montefalco (25), Corciano (15). Afhængig af tidspunktet på året kan du deltage i de mange festivaler, der finder sted i området: Umbria Jazz (Perugia, juli) Eurochocolate (Perugia, oktober) Trasimeno Blues (Lake Trasimeno, månederne fra december-januar) , festivaler af alle slags (trøfler, stege goose, vin, olie ETRA jomfru olivenolie, ...). På Holiday House er der talrige indikationer og anbefalinger til butikker og restauranter i området. ENG: Rental includes lodging, final cleaning, sheets and towels, all utilities except winter heating (on the base of consume) and air conditioned (optional, 35 euro/week). It is required a reservation deposit of about 15% and a caution of about 15%. ITA: Le tariffe includono tutto (pulizia finale, lenzuola e asciugamani, consumi) tranne l'uso del riscaldamento (in base al consumo) e l'uso dell'aria condizionata (opzionale al prezzo di 35 euro/settimana). Si richiede un deposito all'atto della conferma di circa il 15% e una cauzione durante il soggiorno di circa il 15%.